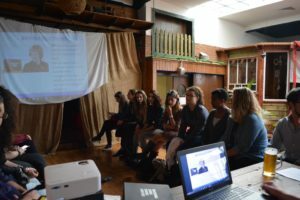 Last March, AEGEE-Torino organised Europe Café about Populism. For this reason, they has been chosen as the ACTive Local of the Month. We spoke to Roberto, Gulia and Luca to find out more! ACT: Which emotions did you have when you know that AEGEE-Torino has been chosen as ACTive local of March? Roberto: We were very excited and honored by knowing that our Antenna was chosen for this recognition. We put a steady effort on this activity and I am glad to see that it has been recognized as useful to the objectives our organisation! Why did you decide to organise that activity? Roberto: Actually, this activity as such dates back to some years ago from an idea of Sergio Genovesi. Despite the activity was a little bit neglected, this year, when we had to decide whether to stop it or not, we just gave it another chance and revitalised it because we thought it was worth having also a cultural side in our local! 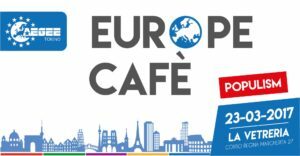 Roberto: We organise the Europe Café on a monthly basis with an average attendance of 15-20 people coming from various parts of Europe (France, Germany, Romania, Poland, to name a few). As mentioned, it is a talk in English open to all those who want to discuss in an international environment. We deal every month with the “hot” topic of the moment: just to give a few examples, we talked about Brexit, the crisis of Schengen, the rise of populist movements, the impact of terrorism on everyday life. In addition, each time we also have a little focus on the electoral moments in the European countries (General Elections, Referenda, and so on). We had many good feedbacks: making available a space for relaxed and thoughtful talking gives a real opportunity for free expression to the international (but also Italian) students in our city. 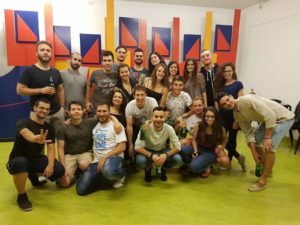 Giulia: We’re keeping them updated about every activity/news regarding the AA or the SP through our social channels, during our weekly meetings and LTCs. We are also quite lucky because we can boast the presence of three ACTies in our local, Gabriele Scollo was in ACT in 2015/2016, Marco Daniele will finish his term at the end of July when I will start with mine for the next year. 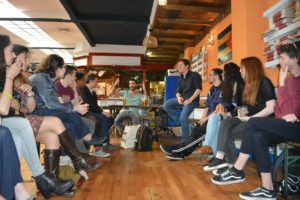 Giulia: As Roberto said the Europe Café isn’t a sporadic activity, but is a regular spot that every month changes its topic taking into account news reports and participants’ interests. This means that a new challenge is waiting for us each month and this is the strength of the event: its flexibility and constant innovation. Besides, this year’s experience increased and stimulated the interest of our members about thematic activities, so maybe we have something on our plate for the next year! You will see! Roberto: The Strategic Plan is sometimes read as a sort of top-down set of orders and, even worst, generally organising activities related to the Action Agenda is too often seen as a constraint. We need to change that! We should take the Strategic Plan as an inspiration for our activities and the AA as an instrument which can help us to put into practice our ideas and to measure their impact. We have the chance to make a real and measurable impact on society, no matter how little or big, and it shouldn’t be wasted. This is the reason why we should all organise this kind of activities. First: KEEP IT SIMPLE. If you overdo with the organisation, you will probably not be able to carry out all the details and be disappointed. If you start from the little things however, you will have a lot of room for improvement and development. After all, Europe Café is simply a nice talk with some international friends and it works because it is simple. Second: INVOLVE PEOPLE. It is really important to have people involved, not only for the impact itself, but because when people are with you, they help you and your job becomes far easier and effective. In Europe Café, the participants are those who make the discussion great for everybody, our job is just to make it work. Third: YOU NEED TO BELIEVE IN YOUR PROJECT. 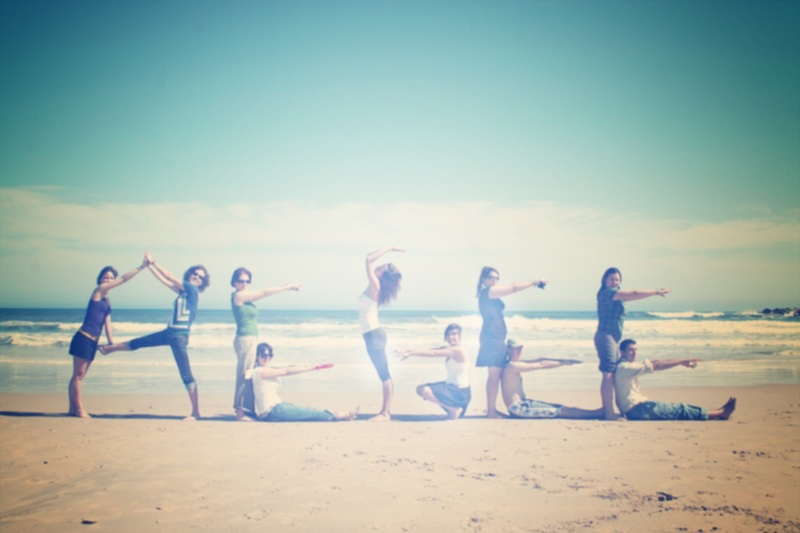 Always think on why you want to organise your activity and make your cause your landmark. Organising something only because you have to is just not worth it. Giulia: AEGEE-Torino was founded in 1992, so this year we celebrate our 25th birthday. We have a long history behind us and among all moments coming from the past we cannot forget 2004, with the Autumn Agora and one of our members, Nicola Rega, as AEGEE-Europe’s President. Now AEGEE-Torino can count on around one hundred members, forty of them really active. Since three years we’re working hard with the aim of growing up, starting from the local level and now focusing on the European one. 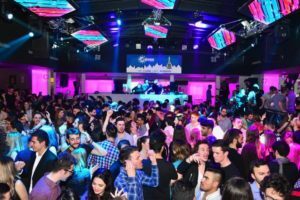 Our efforts led to two strong and stable local events, the “Europe Cafè” and of course the great “Aperitivo linguistico: USE YOUR TONGUE” that attracts each month almost eight hundred students and Erasmus people. In addition six of us are currently involved in European bodies, committees, commissions, interest and working groups. Luca: Organised mess brings great results and happy people! Written by Elena Efremova behalf of Action Agenda Committee.